This $300 gaming headset might actually be worth it. This headset may be exorbitantly priced, but its quality craftsmanship, attractive design, and luxurious soundscapes prove you get what you pay for. How much is too much for a gaming headset? Many would consider anything above $200 a splurge. With so many affordable options on the market, it seems like overkill to opt for pricey extras that don’t usually amount to anything substantial. So what about a product that’s about $100 more? The Victrix Pro AF ANC is a "premium" $299 headset that certainly looks the part. 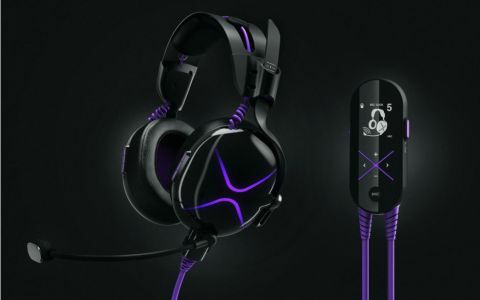 Its glossy black finish with neon purple accent lighting lends a gaudy touch to an otherwise professional-looking headset, as do a few of its other bold—and bizarre—design choices. The colorful, literally labeled “First” mic badge included in the set is written in garish graffiti. Near the ear cups, purple wire coils in on itself like a retro telephone handset. I liked this unique look better than the cookie-cutter designs that dominate the majority of headsets on the market, especially the deep purple hues that make the entire unit pop, and the lit ear cup exterior, which exude a bright glow from across the room. The ventilated ear cups offer an impressive amount of comfort with buttery smooth leatherette padding and room to spare, as well as an easy-to-use built-in cooling system. Its stainless steel headband is surprisingly flexible, without compromising durability. Altogether, the construction is top-notch, but the in-line controller is the only truly awkward portion of the ensemble. It's a AA battery-powered box that hangs at your side, kitted out with a small LCD screen and controls for you to adjust volume, mic gain, and active noise cancelling (ANC) while wearing the headphones. Navigating the LCD screen is quick and easy, a pretty boring experience next to the rest of the headset’s flair. There aren’t touch controls here, just physical buttons. While they feel solid and sturdy, the unit itself is unwieldy, and the controller is about the size of a small TV remote. Fortunately, if you’re sitting and gaming, you won't notice it hanging by your side as long as you adjust the cord. This is very simple to do, as you can slide the mechanism up and down on the thick purple cord to an appropriate length away from you so it won’t get in the way. You can also clip it to your shirt or belt if you’d like to keep it from swinging wildly while you’re gaming. When you hit the ANC button, the noise-dampening effect is immediate. Ambient noise is filtered in to keep out the roar of room fans, the hum of your PC, and all the other distractions of your home that keep you from becoming immersed in your favorite game. While I typically prefer noise isolation, the Victrix's ANC was a pleasant departure from the norm for me, as it did a fantastic job of ensuring I only heard what I needed to focus on: the game and my teammates. Any noise that does make its way through sounds as though it's coming much further away than it actually is. If you also typically opt for noise-isolating headphones, the Victrix’s brand of ANC is well worth checking out. But you'll need to make sure the mic is muted when turned on, as it's not by default, which might be confusing for some. But how does it sound? The headset’s 50mm drivers offered lush soundscapes no matter what I threw at it. Both sound profiles offered balanced low and mid-range tones that lacked the crispness of other models I'm used to, but made for a positive listening experience nevertheless. In games like Call of Duty: WWII and Battlefield 1, the headset handled everything with gusto, including explosions, the other team's voices, and the in-game soldier chatter during matches. I was able to appreciate the wide variety of weapon sounds in great detail, and I swear I played a smidge better due to my enhanced ability to hear approaching enemies in the distance. It was immediately clear how this particular model could be useful to competitive players, as it offered a bit of an edge I hadn’t truly experienced before. Typically, the sound of enemy footsteps tends to blend in with the rest of the game's ambient audio, in my experience. I rarely pay attention to the sound of bullets whizzing by before a bullet sets up camp in my player's skull. But with the Pro AF ANC, these noises were amplified to the point where I noticed the sound of players creeping toward me, cutting through the still silence of a map while shots rang out. I was able to narrowly avoid being killed several times over thanks to these details, something I've never truly experienced with another headset, at least not like this. I swear I played a smidge better due to my enhanced ability to hear approaching enemies in the distance. Though I tried a multitude of games, Hellblade: Senua's Sacrifice proved the perfect testing ground for the Pro AF ANC. It was made with noise-cancelling headphones in mind, and its use of binaural audio offered immediate payoff upon starting the game. The multiple voices whispering in heroine Senua's head from the beginning moments of her journey came through with startling clarity. I wished I had played the entire game with the Pro AF ANC in the first place. I wrapped up my testing with some of my favorite Queens of the Stone Age tracks as well. I typically get a more satisfying, bassy sound from my everyday cheapie pair of SMS Audio Star Wars headphones, but the Pro AF’s balanced range was a pleasant change from thumping bass. I also discovered new, minor details in songs like Lady Gaga's "Sexxx Dreams" that I hadn’t picked up on even after testing pricier headphones. The company's customer support number is etched onto the headband, a testament to how much Victrix believes in its products. Fortunately, it’s tucked away in a more conspicuous place so you’re not sporting huge digits on the headband. I called the support number one evening out of sheer curiosity. To my surprise, I reached a representative within three rings. No automated menus, no nonsense. "How may I help you?" a voice answered. Knowing I had my own personal line to a Victrix representative lent a rather luxurious touch to the product. It’s such a pain to get through to a helpful rep when there’s a real problem, so immediate, 24/7 access to a real person is a bonus. Is Victrix’s high-end headset worth splurging on? All the luxury boxes are certainly ticked, and it offered a premium experience, without a doubt. My biggest gripe with the product was that it's not wireless, especially in this price range. But did it do a better job than, say, my trusty Turtle Beach Elite Pro ($200) or even my HyperX Cloud Stinger ($50)? Only marginally. You’re not going to have to talk to a customer service robot if your headset breaks, but in terms of hardware, you could get by with spending far less. If you’ve got the disposable income and don’t mind compromising on a few features, the Victrix Pro AF ANC is a viable option. If luxe presentation isn’t important to you, I recommend shopping around for something more practical, even if the cool purple accents do seem enticing.